When training to improve agility and change of direction, most people think about different on-field or on-court running and cutting drills, often utilizing different lines or cones for things like the 5-10-5 drill or the pro agility. Cones set up in a square or different shape are often used with athletes performing specific running patterns through and around the cones. These would all be considered predetermined or closed change of direction drills. However, if you are using these drills or incorporating reactive agility drills, one factor that is often overlooked is the role of deceleration in that movement. Deceleration is defined as a reduction in speed or the rate of decreasing velocity. Moreover, we know that being able to accelerate out of a cut or change of direction is extremely important. Hence, being able to decelerate quickly going into that cut is equally important. The higher the rate of deceleration and the faster the athlete can decelerate under control, the quicker that change of direction will be. With that, the ability to decelerate quickly under control depends largely on one thing, eccentric strength. Having the physical strength to quickly decelerate and absorb force is the basis of agility and change of direction. There are two different ways that we for train for improving eccentric strength and deceleration. One is through the use of jumping and landing. The other is in the weight room by emphasizing the eccentric phase of lower body weight training movements. From there we progress to isometric pauses in those same exercises. Below are some of the body weight jumping and landing drills that we incorporate, starting with Level 1 for beginning athletes and progressing from there to more advanced movements. The emphasis is always on soft landings and landing well by decelerating under control and absorbing the landing force. Most importantly, the drills basically progress from single jumps landing on both feet to more intense single leg, multiple jumps with a change in direction or height. Again, the emphasis on these deceleration drills is on the landing aspect just as much as the jumping itself. Furthermore, the possibilities are endless when it comes to creating new ones, but that landing emphasis and having the patience to focus on that must always be there. These are a couple of the coaching cues that I use all the time with all of these types of deceleration drills. When it comes to strength training for deceleration, we start with focusing on the eccentric phase of the exercise. With this approach, the athlete lowers the weight very slowly and under control for a specified length of time. Once the bottom of the range of motion is hit, fast concentric contractions take place. Secondly, lowering slowly increases the time under tension in the muscle while focusing on the same type of contraction used when decelerating to make a cut to change direction. Finally, following that with a fast concentric contraction helps to train the re-acceleration coming out of the cut. Basically, the lighter the weight, the longer the eccentric time. The heavier the weight, the shorter the eccentric time, the lower the reps and sets. Following the eccentric block is our isometric block. Once we have worked on developing eccentric strength, we focus on decelerating very quickly, slamming on the breaks, and pausing at the bottom of the range of motion. From there, it is again followed with a fast concentric contraction after holding the pause for a prescribed length of time. By utilizing pauses in this manner we are training rapid deceleration and force absorption, followed by rapid re-acceleration from a dead standstill. Both of these things are critical for improving agility and change of direction. As with our eccentric block, the isometric training yields longer pauses with lighter weight. In comparison, our pauses get shorter as the weight increases. Lastly, we finish with fast, full-speed training. We have gotten some great results by focusing on these two different training blocks combined with fast concentric contractions. It’s very easy to do, can be incorporated into your weight training programs very easily and can be used for athletes of all ages. Once you have these strength aspects developed, you will quickly see the agility and the ability of your athletes to change direction improve dramatically. Scott Meier is currently in his 19 year at Farmington High School (MN) where he is the Strength & Conditioning Coach. He is also a Physical Education Teacher at FHS and teaches Sports Conditioning, Weight Training, and 9th grade Fitness For Life classes. He coached Farmington’s competitive weightlifting for 9 years, and in that time, the Tigers earned four state team titles, over 40 individual state champions, and multiple state record holders. Prior to that he was the head Strength and Conditioning Coach at Lakeville (MN) High School and worked as a personal trainer for 6 years. Scott is featured in the award-winning documentary “My Run” which tells the story of his 56-year-old client who ran 75 marathons in 75 days. He continues to compete in track & field at the masters level where he is a nationally ranked sprinter and holds several state age-group records. 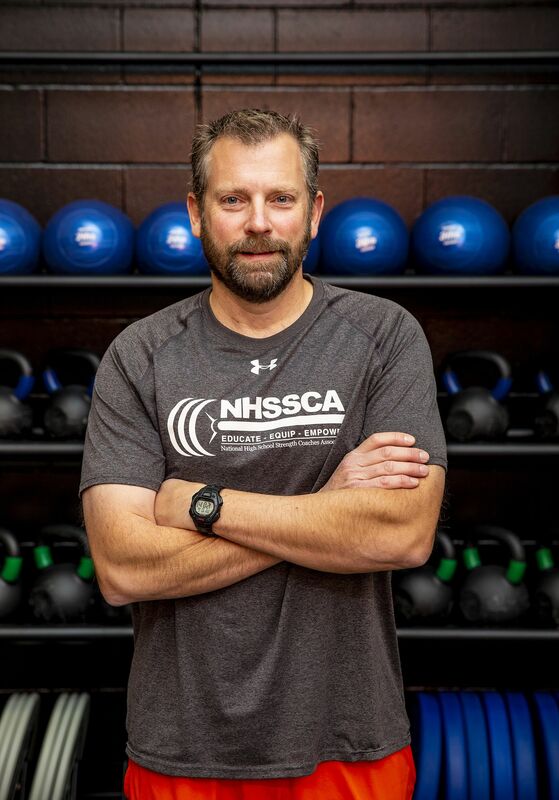 Scott is the current Minnesota state director of the National High School Strength Coaches Association.